The simplest path to upgrade PCs currently running Windows 7, Windows 8, or Windows 8.1 to Windows 10 is through an in-place upgrade. You can use a System Center Configuration Manager task sequence to completely automate the process. For the purposes of this topic, we will use three machines: DC01, CM01, and PC0001. DC01 is a domain controller and CM01 is a Windows Server 2012 R2 standard machine, fully patched with the latest security updates, and configured as a member server in the fictional contoso.com domain. PC0001 is a machine with Windows 7 SP1, targeted for the Windows 10 upgrade. For more details on the setup for this topic, please see Deploy Windows 10 with the Microsoft Deployment Toolkit. After you create the upgrade task sequence, you can create a collection to test a deployment. In this section, we assume you have the PC0001 machine running Windows 7 SP1, with the Configuration Manager client installed. Review the Windows 10 Enterprise x64 Upgrade collection. Do not continue until you see the PC0001 machine in the collection. In this section, you create a deployment for the Windows 10 Enterprise x64 Update application. On CM01, using the Configuration Manager console, in the Software Library workspace, right-click the Windows vNext Upgrade task sequence, and then select Deploy. On the General page, select the Windows 10 Enterprise x64 Upgrade collection, and then click Next. On the Scheduling page, accept the default settings, and then click Next. On the User Experience page, accept the default settings, and then click Next. On the Alerts page, accept the default settings, and then click Next. On the Summary page, click Next, and then click Close. In this section, you start the Windows 10 Upgrade task sequence on PC0001 (currently running Windows 7 SP1). On PC0001, start the Software Center. 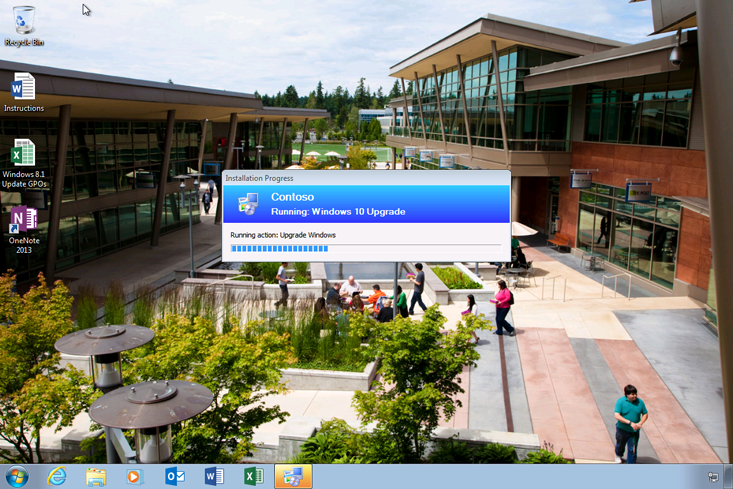 Select the Windows vNext Upgrade task sequence, and then click Install. When the task sequence begins, it will automatically initiate the in-place upgrade process by invoking the Windows setup program (Setup.exe) with the necessary command-line parameters to perform an automated upgrade, which preserves all data, settings, apps, and drivers. Figure 2. 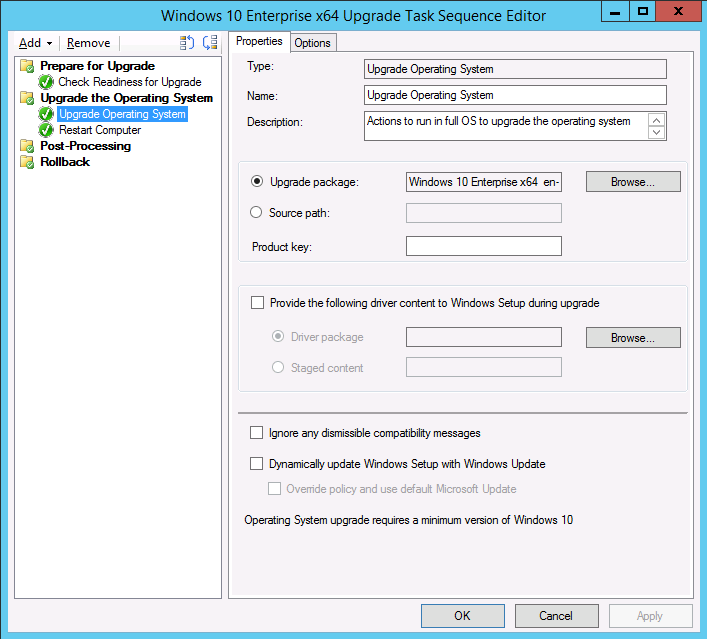 Upgrade from Windows 7 to Windows 10 Enterprise x64 with a task sequence. After the task sequence finishes, the computer will be fully upgraded to Windows 10. With System Center Configuration Manager Current Branch, new built-in functionality makes it easier to upgrade to Windows 10. For more details about Configuration Manager Current Branch, see the Configuration Manager Team blog. An evaluation version is currently available for you to try. The instructions below are specific to the Technical Preview 2 release and may change after the next version of Configuration Manager is released. First, you need to create an operating system upgrade package that contains the full Windows 10 Enterprise x64 installation media. On CM01, using the Configuration Manager console, in the Software Library workspace, right-click the Operating System Upgrade Packages node, then select Add Operating System Upgrade Package. On the Data Source page, specify the UNC path to the Windows 10 Enterprise x64 media, and then click Next. On the General page, specify Windows 10 Enterprise x64 Upgrade, and then click Next. Right-click the created Windows 10 Enterprise x64 Update package, and then select Distribute Content. Choose the CM01 distribution point. On CM01, using the Configuration Manager console, in the Software Library workspace, right-click the Task Sequences node, and then select Create Task Sequence. On the Create a new task sequence page, select Upgrade an operating system from upgrade package, and then click Next. On the Task Sequence Information page, specify Windows 10 Enterprise x64 Upgrade, and then click Next. On the Upgrade the Windows operating system page, select the Windows 10 Enterprise x64 Upgrade operating system upgrade package, and then click Next. Click Next through the remaining wizard pages, and then click Close. Figure 3. The Configuration Manager upgrade task sequence. After you create the upgrade task sequence, you can create a collection to test a deployment. In this section, we assume you have the PC0001 machine running Windows 7 SP1, with the next version of System Center Configuration Manager client installed. Select the Windows 10 Enterprise x64 Upgrade task sequence, and then click Install. When the task sequence begins, it automatically initiates the in-place upgrade process by invoking the Windows setup program (Setup.exe) with the necessary command-line parameters to perform an automated upgrade, which preserves all data, settings, apps, and drivers. After the task sequence completes, the computer will be fully upgraded to Windows 10.